Every once in a while I find a wine that seems like its been grown, made and marketed towards people like myself. On a recent trip to basically the only wine store I go to these days, I found a wine that simply made its purchase mandatory. No questions. No doubts. No checking of my finances before hand. There are only a few grapes that could induce this kind of reaction. 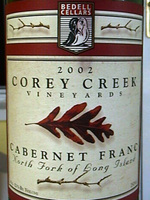 And if this isn't your first trip to my site, you probably know the that I'm talking about cabernet franc. But this bottle had even more going for it... 30% lemberger! And from the Finger Lakes to boot. 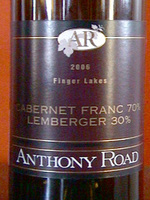 Anthony Road Winery is located on the west side of Seneca Lake. I've stopped in quickly on my way down to NYC in the past and was mildly impressed with the reds, which were really the only wines I tasted there. The fact is nothing really stood out compared to the other FL reds I tried that day. I had pretty much forgotten about them until last week when I found this bottle. Why am I so thrilled about this wine? I just think these two grapes are suited for cool climate viticulture up here in the FL and Niagara USA Region. Rarely do you see them together and I'm not sure why that's the case. I know Fox Run Vineyards also bottled a blend of the two that won an award or two, but it wasn't available when I visited. So this bottle is my first introduction to the cab franc/lemberger wines of the FL. It's been five years since I've classed it up at the South Beach Wine and Food Festival. The event has ballooned into a huge success with tickets becoming more and more elusive every year since its inception some seven years ago. Aside from the Grand Tasting Tent which is actually on the sand of south beach both saturday and sunday, there are several other wine and culinary events, seminars, demonstrations, and tastings all over Miami over the course of four days. 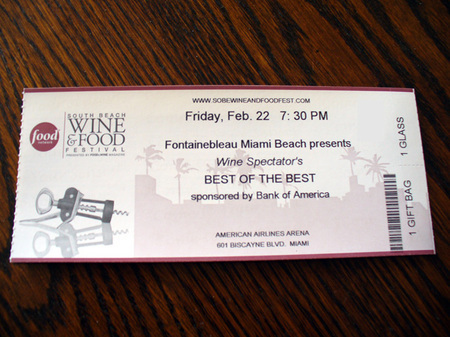 Tonight's event is the Wine Spectator "Best of the Best" tasting at the suites of the American Airlines Arena in Miami. My fiance and I were lucky enough to get tickets and I can't wait to test my palate on what should be the cream of the crop reserve and estate selections of the show. I'm prepared to push and shove my way through well dressed wine snobs and their trophy wives to get samples but I just don't know where I'm going to spit yet. Shortly after Long Island turned me on to merlot, a friend mentioned a bottle he had had while dining at Felidia restaurant in NYC. 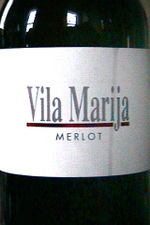 The sommelier recommended a merlot from the Friuli region of northern Italy. Having been blown away by the wine, he managed to salvage the label and pass along the good word to me. I have since-found a couple other producers from that area which make merlot in the same minerally, lightly tannic, and vibrant style. These wines aren't easy to locate as even wine boutiques that only carry Italian wines may only have one such bottle to choose from if any, with retail prices in the mid twenty dollar range. Movia, the Slovenian producer of this bottle is situated on the border of Friuli and Slovenia. They practice organic and biodynamic winemaking while producing only about 13,000 cases a year. This bottle was on sale for $11 (from $15) at my favorite local wine store. 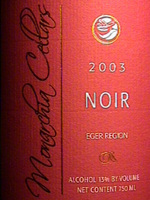 This 2005 bottling is a blend of merlot, cabernet sauvignon, and pinot noir, surprising since it is labeled as merlot. It's not much of a secret anymore that Portuguese reds can be quite satisfying for a fraction of the cost of the competition. I figure that these wineries never became obsessed with single varietal releases, never spent the big bucks on marketing, and never got into the Parker influenced over the top fruit flavors that people seem to look for these days. On a recent trip to a wine "outlet" the other day I found an inexpensive bottle all alone on the shelf. Psychologically speaking when I see the last bottle on a shelf I feel one of two things. One, it must be good if the rest have already been bought. Two, what if I like it and now I know I can't get anymore? For six bucks, I had nothing to lose. 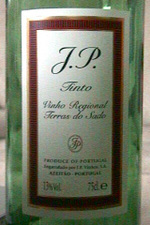 This bottle is not your average Portuguese red. It comes from the Setubal Peninsula, an area I don't see often and instead of being a carefully crafted blend of indigenous grapes, it one one single varietal called Castelao or Periquita. I've been seduced by the Mencia grape in the past. It was probably the comparisons to Cabernet Franc that motivated earlier purchases. 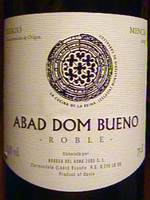 My Spanish wine kick also fueled my interest in an unpopular grape that hails from Bierzo, Spain. It generally grows on high altitude hillsides and has been known to bring spicy notes as well as gentle red fruit flavors. Every once in a while I get motivated. If you read the date of my last post on this site, you might think it's been a long time coming. I think the downside of geeking out on wine is that your taste may get more expensive with time. In my case, the desire to try New York State wines and boutique winery offerings has led to less wine consumed at a higher price point. Now I admit that this weblog was meant to find those best buy gems from anywhere, so tonight I'm going back to the roots of this blog because I found one of those intriguing under $10 wines. Lately I've been seeking out cool climate wines that would do well in NYS. I know Cab Franc does well throughout the state of New York, and I've tasted a hell of a lot of it over the last two years. So now I'm tasting Lemberger, aka Blaufrankish, aka Kekfrankos, aka ect... I've tried some Washington State examples, some NYS, as well as some from its home in Austria. Most are in the $15- $20 range and they have been hit or miss. Well this time I found an under $10 bottle from Hungary at Premier Wines in Buffalo. The 2002 growing season must have been a good one for North Fork red grape growers. It was the 02' Osprey's Dominion Cabernet Franc that motivated a spending spree on Cab Franc that me to having a the franc filled wine fridge I have today. I've enjoyed a few others from the same vintage but nothing that excited me as much as the Osprey's. A few days ago I was reminded of my first innocent experiences with great Cab Franc. Even though this site hasn't seen many updates recently, my passion for wine hasn't diminished. I've learned that a home is a lot of work, and a home with 10 acres of land is a hell of a lot of work. In my spare time though I've been getting to know that the Niagara Escarpment area with fresh eyes and an open mind. There's so much to tell you about up here I could never put it in this blog. That's why I created NiagaraEscarpment.net. It's essential reading for anyone coming to the Niagara Falls area that appreciates wine, agriculture, and natural beauty. During my last trip to the finger lakes I was confronted with several important decisions. What lake are we gonna do today? East or west side? Start north, head back south towards the cottage? Bring lunch? Stop for lunch? Where to eat dinner? Are reservations needed? 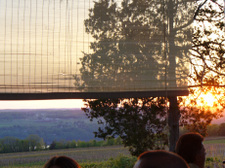 When choosing a wine country dinner they are a few musts. The restaurant must have an ecletic menu. A heavy Italian cuisine focused place will not cut it after a long day of drinking. It must have farm fresh ingredients since after all we are in the country. Lastly, the wine menu must have extensive local wine options at fair prices. After considering a few winery restaurants for our first night's dinner, I ended up taking some advice from the owner of Catherine Cottages, the place we stayed at in Montour Falls, just south of Seneca lake. He emailed us a list of restaurants and luckily I read it in time to get reservations at the Stonecat Cafe in Hector, NY. What sold me on this place was its use of organic ingredients across the board. It's located on the east side of Seneca Lake and the view is spectacular. I had some short ribs and a triple cream on crostini appetizer. 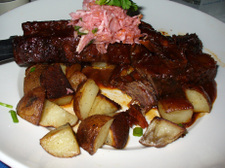 My fiance and our friends loved it and it was somewhat of a relief as we are used it to gourmet eats from our new york city days. This restaurant was spot on in everyway and satisfied all the must-haves I previously mentioned. I highly recommend this place to anyone that wants a delicious thought provoking meal when they are winding down from a days worth of wine tasting in the Finger Lakes. When I think of exciting grapes currently being experimented with in the Finger Lakes and Niagara Wine countries, there are three or four that get my blood flowing. The first is Syrah. Not those jammified Syrahs that you can find anywhere. I'm talking about cool climate ones that combine good acidity with pepper and light tannins. 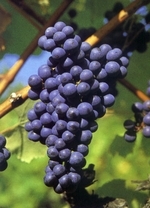 The other two grapes are the Austrian grapes Gruner Veltliner, Blaufrankisch, and Zweigelt. Spelling them is tough enough let alone pronouncing them. I know Hermann Wiemer is growing Blaufrankisch and Gruner Veltliner, funny enough cause I picked up a couple of each last time I visited the winery. Currently I believe they are just blending grapes in his arsenal. I've tried Lemberger, our not much friendlier name for Blaufrankisch, from Fox Run Vineyards, Goosewatch, and Seneca Shore Vineyards in the Finger Lakes. The latter of the three was surprisingly my favorite. As for Zweigelt, a cross of St. Laurent and Blaufrankisch, I know Konzelmann Winery in Ontario makes it as well as a few others wineries in Canada. All this wine geek banter takes me to my point and the reason I got excited enough to update my site while I run around in circles of sh*t to do in my new country home. The New York Times done did an article and an interactive feature on Zweigelt and Blaufrankisch the other day. Cheers to that. The reviews were obviously Austria intensive as they should have been, while fascinating at the same time. Too bad I'm not in NYC anymore cause I don't think I'll find these wines in my area. So if you can, try some of them for me.